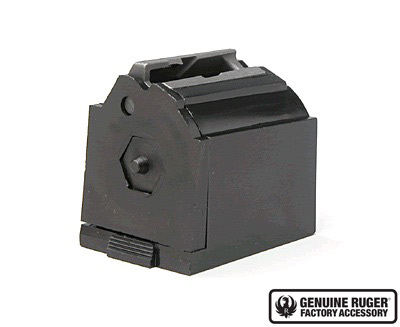 10-round bolt-action .22 LR caliber magazine with Steel Feed - Black Plastic *Due to changes in the law effective October 1, 2013 Ruger is not able to sell magazines to CONNECTICUT residents. Ruger cannot bill to or ship this magazine to Brooklyn, Buffalo, New York City, or Rochester, New York. DO NOT ORDER THIS PRODUCT if you live in these cities. Having both an early 77/22 made in 84 and a newer K77/22 made in 08, Ive experienced no problems whatsoever using these magazines in either rifle. I have a 1986 version of the 77/22 and these magazines fit flush with the bottom of the receiver and can be inserted and ejected as designed with no fumbling. I can easily load 10 rounds of .22 LR into these as well and they function perfectly. Build quality is very good, the same as it has always been in my experience with Ruger factory mags. I have no negative issues to report. Ive had no trouble with this item. Works well and easy load and pack. I have two or three loaded in my pocket when Im in the woods. My grandsons are learning on this system and have no problems. Good job Ruger! MADE IN AMERICA! Very poor quality. .030 or approx. 1/32 too wide. You find this out after youve opened the packages. Deserves a minus + minus rating.